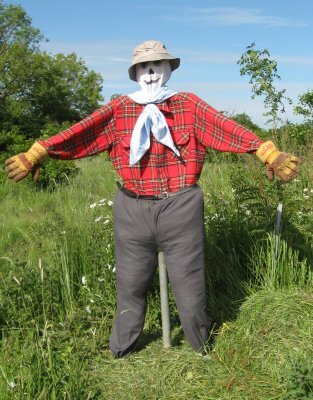 A Scarecrow was erected on the Bear Mead Sanctuary, using the author's old clothes. 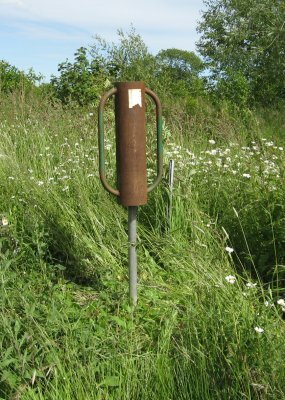 (3479) Six foot of scaffolding pipe was hammered into the ground with a post rammer, to strengthen the skeleton in gales. 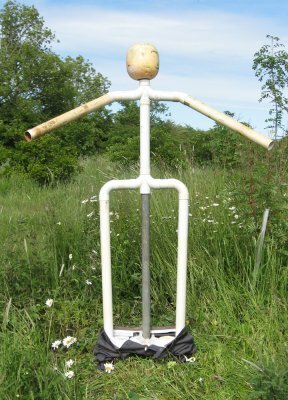 (3480) A skeleton was built using 50mm OD plastic plumbing piping and angles with fishing float as a head (supported by a narrower pipe). The legs supported the skeleton. Old golfing trousers were added. 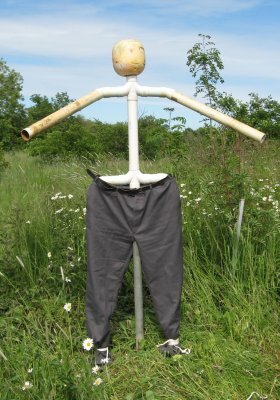 (3481) The trousers were raised to the hips, held there by an old belt and fastened at the ankles with laces (so the grass stuffing doesn't exit). 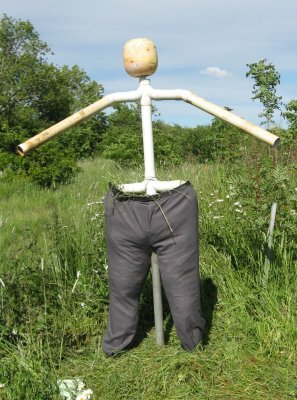 (3482) The trousers were stuffed with grass cut that day from the adjacent field. (3483) Remaining old clothes were attached and held together with numerous large nappy pins. An old Royal Stewart tartan climbing shirt, old gardening gloves, a face drawn on an old pillow case with black and blue permanent marker pen (red runs), an old hat with large swan feather, and a neckerchief cut from an old bed sheet. 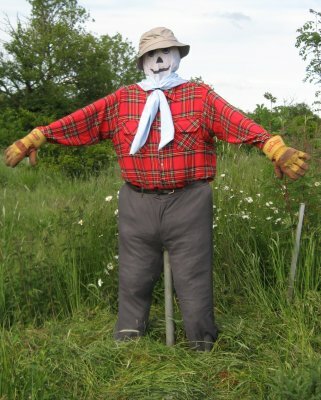 (3484) The shirt (minus arms) was stuffed with the cut field grass through the chest, using a small handful at a time. Fasten all the buttons afterwards. (3487) Hat replaced by blond wig due to high winds, his new name will be Boris! 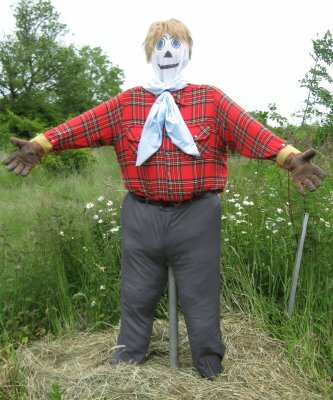 It remains to be seen how the scarecrow withstands high winds, rain and the bleaching effect of bright sun.